Well, I hope you’re going to enjoy ‘Tales from the Royal Wardrobe’ tonight. I think I shall be enjoying myself this evening not least because I’ll be watching with my friends from the crew with maybe a cocktail or two to hand. Who’s that? Is it a character from Mad Men taking a trip to 1960s London? No, silly, it’s me! A member of my family took one look at this picture and said, ‘I can tell that you’re ACTING, I wish you wouldn’t do that’. Ok, I admit I’m a bad actor, and indeed I was pretending that I’d been lucky enough to live in the early sixties and to go for a fitting at the Queen’s designer Hardy Amies. In fact, the Queen did not go to Savile Row for her fittings, Amies himself went to Buckingham Palace. Apparently he was a little chagrined that he had to use the back door. To the left you can see our brilliant director Nick (the hairy one), and our fantastic camera man Mike. 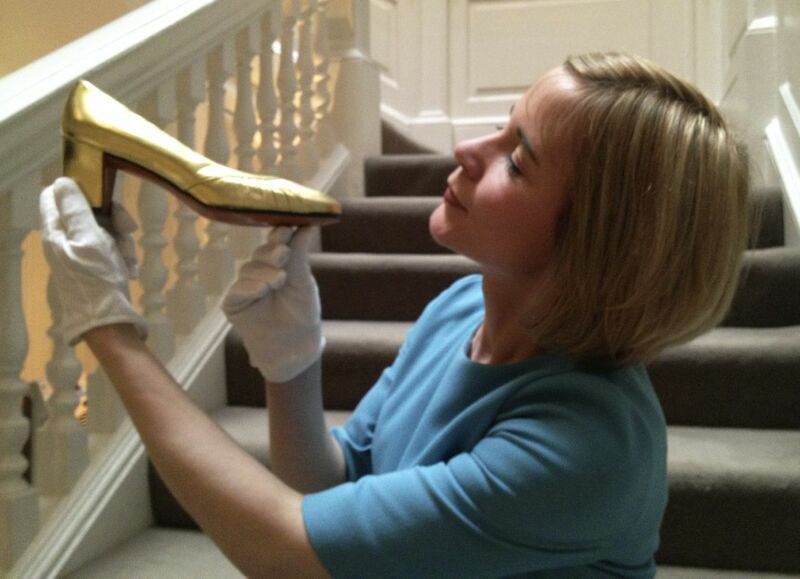 Here I’m having a good slaver over a golden shoe, worn by the Queen in the 1970s. So stylish! So sad it didn’t make it into the programme! We always have too many things to include. And so sad too the shoe is on its own: somewhere along the way before it entered the Royal Ceremonial Dress Collection, our 10,000-piece costume collection at Historic Royal Palaces, its partner got lost. 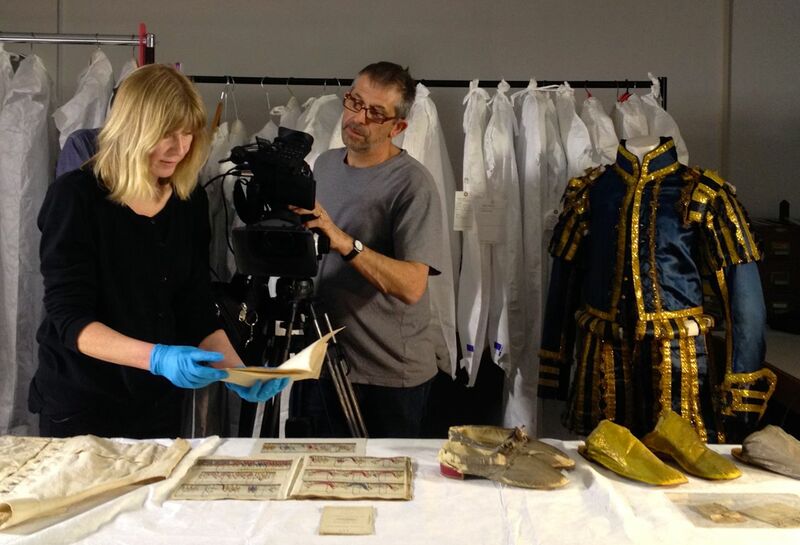 Here’s Mike again, filming a book being held by Beatrice Behlen, who was formerly my colleague at Historic Royal Palaces and is now the curator of the really superb collection of costume at the Museum of London. Lucky Beatrice. It’s not just any old book: it’s the list of lots sold when George IV’s costume collection was auctioned off after his death. Beatrice is showing Mike the page that lists the funniest lot of all: ‘a red petticoat and two Nun’s habits’. Fancy dress! And here I’m being crammed into one of my costumes. This 1750s mantua-type dress was possibly my favourite – so elegant! So pretty! So impractical! The lady doing a wonderful job of pinning me into it is Lauren from Past Pleasures. 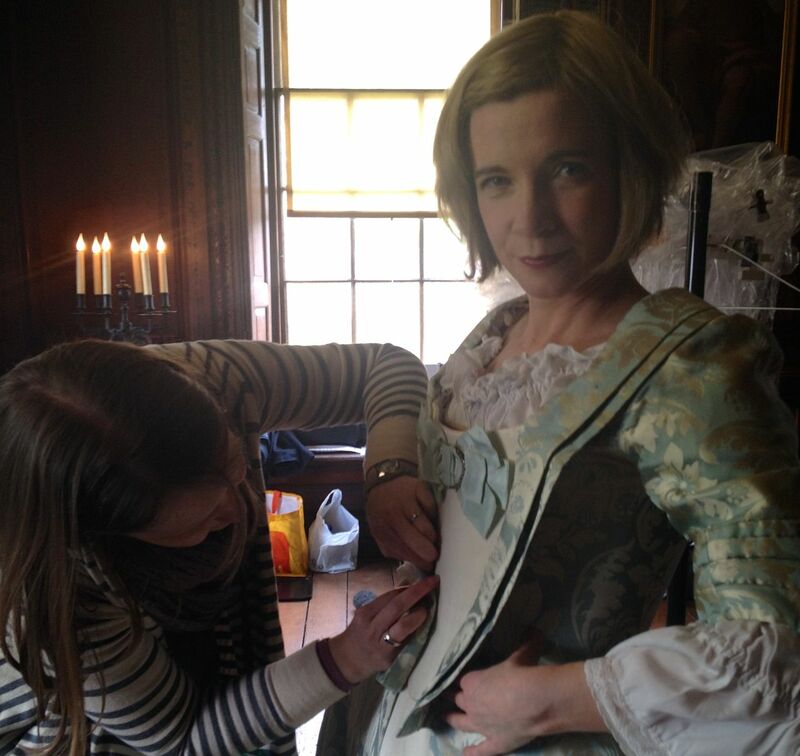 She’s an absolute expert at this kind of thing because she helps look after all the Past Pleasures performers’ costumes that you can see every day being worn around Historic Royal Palaces sites for the amusement and education of our visitors. And here I’m demonstrating that I don’t really know how to play golf. This is at the Surrey golf club where Edward VIII was the President in the 1930s, and we were there to discuss his promotion of sportswear and other trendy informal ways of dressing that would catch on among the Bright Young Things of his set. The golf club was a lovely place to film: warm, welcoming, friendly people, and – brilliantly for me – really huge comfortable changing rooms with showers and loos. As we were leaving the golf club, though, our cameraman Mike was looking a bit pale, and I asked him what the matter was. Apparently he’d just visited the gentlemen’s loo himself, passing through the changing room to get there on the way, and he had been slightly blind-sided by a room full of naked golfers. Now, that wasn’t on the Risk Assessment. Loved it. Another brill programme by the wonderful lucy. Watched last nights programme Avery enjoyable and informative way to spend an hour At last as a mere male I now know what a Mantua actually looks like! One of his friends once turned up at the races in a tweed suit Edward’s comment was Morning Harris going ratting! The lovely Lucy triumphs again! A delight to watch as usual and crammed full of interesting facts and figures (some larger than others!) Talking of large figures; I have recently discovered a George IV coronation costume similar to that shown in the progamme in a private collection and am in the process of conserving it ready for public display. 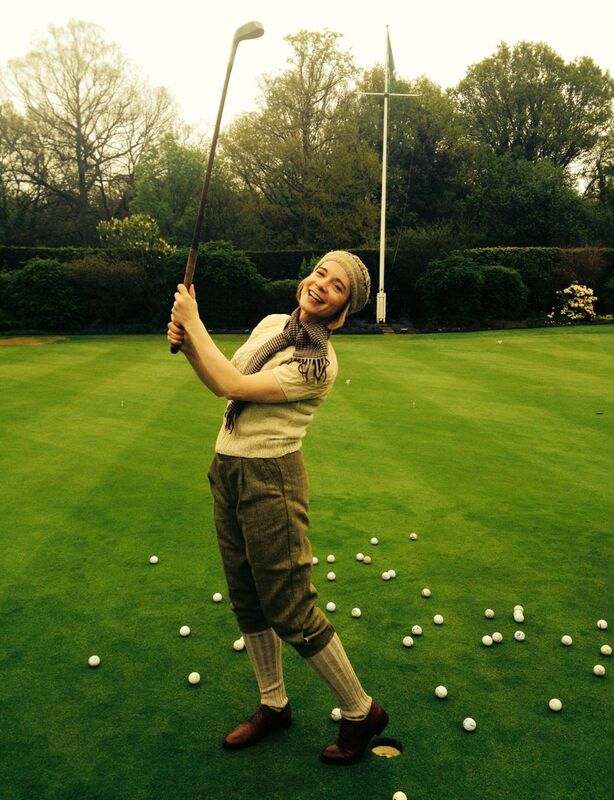 I love how you are holding the golf club like an actual club, as if you’re going to cheerful bash somebody’s head in! Another interesting programme I even got the good wife to view,well done again. Roger. Loved the programme. More please Lucy. I have only just finished watching the ‘Tales from the Royal Wardrobe’ Yet another wonderful program from Dr Lucy. very interesting and wonderfully presented. looking forward to more. Btw, Lucy, I’ve watched the program several times since. I’d kinda regarded it on first viewing as “frothy & entertaining” and over far too soon. Very enjoyable, but I really didn’t expect it to survive repeated viewings. Whoops! Wrong! You guys crammed LOADS into that program – a big appreciative “well done” to the whole team. Thank you for another brilliant program. Are the costumes custom tailored for you? Do become part of your personal collection or do they go to the palaces for education? What was the music used in Tales from the Royal Wardrobe please?